Bawean is an Island that administratively part of Gresik Regency, East Java. It approximately located in 150Km north of Surabaya. Bawean is dominated by an extinct volcano at its center that rises to 655 m above sea level. It is divided into 2 districts, which is Sangkapura and Tambak. Bawean has rich potentials in nature, especially the islands and there is endemic species, which is Bawean Deer. Along with the potential in nature resources, Bawean is also rich by its tourism development. There are many destinations that popularly visited by both local or outside Gresik. Kastoba Lake, Noko Gili Island, Noko Selayar Island, Tanjung Gaang and many more is one of those magnificent destinations in Bawean. Amazing Bawean Island application is now available to give review and guidance about those tourism destinations. 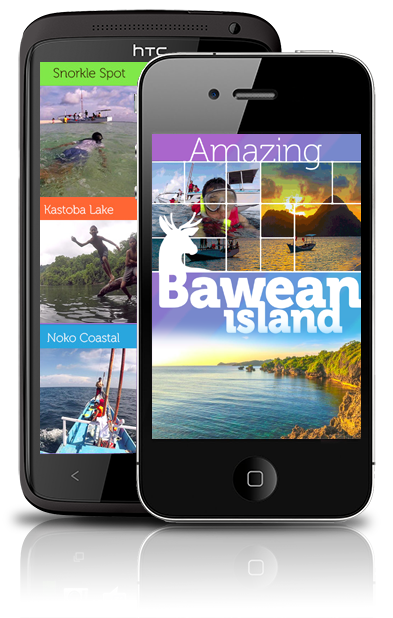 Completed by high resolution pictures and short description, this application will show you the beauty of Bawean Island in glance before you pack your bag pack.